SANTA CLARA, Calif. - NFL lineman Ray McDonald has been arrested for the second time this week. The Santa Clara Police Department said the former San Francisco 49ers defensive end was arrested Wednesday for violating a restraining order by being at a residence in Santa Clara. The restraining order was issued after a domestic violence incident Monday in Santa Clara in which the 6-foot-3, 290-pound McDonald allegedly broke down a bedroom door to get to his former fiancee and their infant. McDonald was arrested on suspicion of domestic violence and child endangerment, but was free on bail. The Chicago Bears released the lineman hours after that arrest. On Wednesday, Santa Clara detectives found McDonald him at a Togo's Sandwiches in Santa Clara, where they arrested him without incident. He was booked into Santa Clara County Jail. The San Francisco Chronicle reported that he posted $5,000 bail late Wednesday night and left the jail in San Jose. McDonald's attorney, Steve DeFilippis, told the San Jose Mercury News that neither he nor his client had been notified about the restraining order. DeFilippis told the newspaper McDonald had gone to the residence Wednesday to meet with a defense investigator, who had spoken to the woman who lived there. She told him she would not be home. 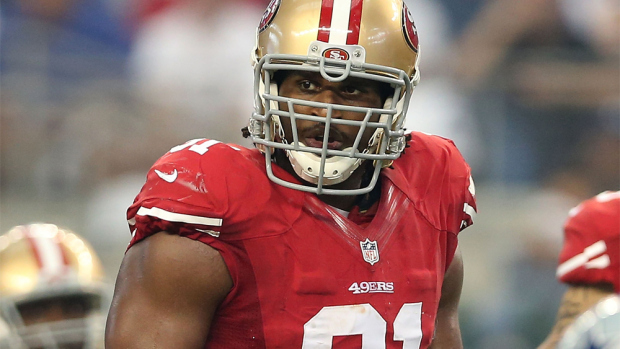 The 49ers released McDonald in December citing a "pattern of poor decision-making." That move came just a month after Santa Clara County prosecutors declined to file charges against McDonald in a separate domestic violence investigation stemming from an arrest on Aug. 31 while celebrating his 30th birthday at his home. Prosecutors cited conflicting versions of what happened, a lack of verifiable eyewitnesses and a lack of cooperation by the alleged victim, McDonald's fiancee, in explaining their decision. McDonald says security camera footage will show a consensual sexual encounter occurred in his hot tub. Police say the woman doesn't recall any sexual encounters and reported blacking out after drinking alcohol and falling at McDonald's home. She said she went to police after waking up naked next to McDonald. The Santa Clara County district attorney is looking at the case.